Podolia or Podilia (Ukrainian: Подíлля, Podillja, Russian: Подо́лье, Podolʹje, Polish: Podole, German: Podolien, Lithuanian: Podolė) is a historic region in Eastern Europe, located in the west-central and south-western portions of present-day Ukraine and in northeastern Moldova (i.e. northern Transnistria). The term is derived from Old Slavic po, meaning "by/next to/along", and dol, "valley" (see dale). The area is part of the vast East European Plain, confined by the Dniester River and the Carpathian arc in the southwest. It comprises an area of about 40,000 km2 (15,000 sq mi), extending for 320 km (200 mi) from northwest to southeast on the left bank of the Dniester. In the same direction run two ranges of relatively low hills separated by the Southern Bug, ramifications of the Avratynsk heights. The Podolian Upland, an elongated, up to 472 ft (144 m) high plateau stretches from the Western and Southern Bug rivers to the Dniester, includes hill countries and mountainous regions with canyon-like fluvial valleys. Podolia lies east of historic Red Ruthenia, i.e. the eastern half of Galicia, beyond the Seret River, a tributary of the Dniester. In the northwest it borders on Volhynia. 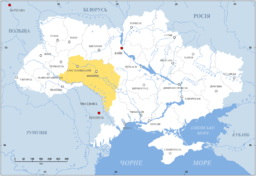 It comprises the present-day Ukrainian Vinnytsia Oblast and southern and central Khmelnytskyi Oblast. The Podolian lands further include parts of adjacent Ternopil Oblast in the west and Kiev Oblast in the northeast. In the east it comprises the neighbouring parts of Cherkasy, Kirovohrad and Odessa Oblasts, as well as the northern half of Transnistria. Two large rivers, with numerous tributaries, drain the region: the Dniester, which forms its boundary with Moldova and is navigable throughout its length, and the Southern Bug, which flows almost parallel to the former in a higher, sometimes swampy, valley, interrupted in several places by rapids. The Dniester forms an important channel for trade in the areas of Mohyliv-Podilskyi, Zhvanets and other Podolian river-ports. In Podolia, "black earth" (chernozem) soil predominates, making it a very fertile agricultural area. Marshes occur only beside the Bug. A moderate climate predominates, with average temperatures at Kamianets-Podilskyi of 9 °C (-4 °C in January, 20 °C in July). Russian-ruled Podolia in 1906 had an estimated population of 3,543,700, consisting chiefly of Ukrainians. Significant minorities included Poles and Jews, as well as 50,000 Romanians, some Germans, and a few Armenians. The chief towns include Kamianets-Podilskyi, the traditional capital, Balta, Bar, Bratslav, Haisyn, Khmelnytskyi, Letychiv, Lityn, Mohyliv-Podilskyi, Nova Ushytsia, Olhopil, Skala-Podilska, Vinnytsia, and Yampil. In Moldova, the major Podolian cities are Camenca and Rîbniţa. Podolia is known for its cherries, mulberries, melons, gourds, and cucumbers. The country has had human inhabitants since at least the beginning of the Neolithic period. Herodotus mentions it as the seat of the Graeco-Scythian Alazones and possibly Scythian Neuri. Subsequently, the Dacians and the Getae arrived. The Romans left traces of their rule in Trajan's Wall, which stretches through the modern districts of Kamianets-Podilskyi, Nova Ushytsia and Khmelnytskyi. During the Great Migration Period, many nationalities passed through this territory or settled within it for some time, leaving numerous traces in archaeological remains. Nestor in the Primary Chronicle mentions four apparently Slavic tribes: the Buzhans and Dulebes along the Southern Bug River, and the Tivertsi and Ulichs along the Dniester. The Avars invaded in the 7th century. Prince Oleg of Kiev, extended his rule over this territory known as the Ponizie, or "lowlands." These lowlands later became a part of the Rus' principalities of Volhynia, Kiev, and Galicia. 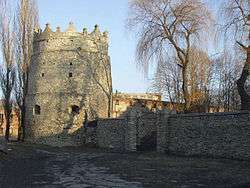 In the 13th century Bakota served as its political and administrative centre. In the 13th century, the Mongols plundered Ponizie; Algirdas (Olgierd), prince of the Grand Duchy of Lithuania, freed it from their rule following his victory against the Golden Horde in the Battle of Blue Waters of 1362, annexing it to his own territories under the name of Podolia, which has the same meaning as Ponizie. Polish colonisation began in the 14th century. After the death of the Lithuanian prince Vytautas (Vitovt) in 1430, Podolia was incorporated into Podolian Voivodeship of the Polish Crown, with the exception of its eastern part, the Province of Bratslav, which remained with Lithuania until its union with Poland in the Union of Lublin of 1569. Apart from an Ottoman occupation (1672–1699) and administration as Podolia Eyalet, the Poles retained Podolia until the partitions of their country in 1772 and 1793, when the Austrian Habsburg Monarchy and Imperial Russia annexed the western and eastern parts respectively. During Ottoman rule, Podolia was a province with its center was Kamaniçe and was divided sanjaks of Kamaniçe, Bar, Mejibuji and Yazlovets (Yazlofça). From 1793-1917, part of the region was the Podolia Governorate (Russian: Подольская губерния [Podol’skaja gubernija]; Ukrainian: Подільська губернія [Podil’s’ka hubernija]) in southwestern Russia bordering with Austria across the Zbruch River and with Bessarabia across the Dniester. Its area was 36,910 km2 (14,251 sq mi). In the 1772 First Partition of Poland, the Austrian Habsburgs had taken control of a small part of Podolia west of the Zbruch River (sometimes also called "Southern Podolia") around Borschiv, in what is today Ternopil Oblast. At this time, Emperor Joseph II toured the area, was impressed by the fertility of the soil, and was optimistic about its future prospects. Poland disappeared as a state in a third partition in 1795 but the Polish gentry continued to maintain local control in both eastern and western Podolia over a peasant population which was primarily ethnically Ukrainian whose similarity to the other East Slavs already subject to the Habsburg Monarchy was showcased in a 1772 book by Adam F. Kollár and was used as an argument in favor of annexation by the Habsburgs. The Ternopil (Tarnopol) region of western Podolia was briefly taken by Russia in 1809 but reverted to Austrian rule in 1815. Within the Austrian Empire, western Podolia was part of the Kingdom of Galicia and Lodomeria which, in 1867 with the formation of Austria-Hungary, became an ethnic Pole-administered autonomous unit under the Austrian crown. 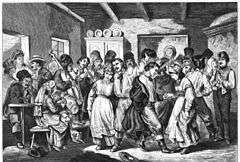 At the end of the nineteenth century and the beginning of the twentieth, Austrian Podolia witnessed a large scale emigration of its peasant population to western Canada. With the collapse of Austria-Hungary following World War I in November 1918, western Podolia was included in the West Ukrainian People's Republic, but came under Polish control in 1919 which was confirmed in the Poland–Ukrainian People's Republic agreement in April 1920. Podolia was briefly occupied in 1920 by Soviets during the course of the Polish-Soviet War. At same war, Poland briefly occupied eastern Podolia in 1919 and again in 1920. After the Peace of Riga the Polish control of western Podolia was recognized by the USSR. USSR retained eastern one. There were pogroms during this period. In Poland from 1921 to 1939, western Podolia was part of the Tarnopol Voivodeship. Eastern Podolia remained to the Ukrainian SSR and between 1922 and 1940, in the southwestern part, the Moldavian Autonomous Soviet Socialist Republic was created. In 1927 there was a massive uprising of peasants and factory workers in Mohyliv-Podilskyi, Kamianets-Podilskyi, Tiraspol and other cities of southern Ukrainian SSR against Soviet authorities. Troops from Moscow were sent to the region and suppressed the unrest, causing around 4000 deaths, according to US correspondents sent to report about the insurrection, which was at the time completely denied by the Kremlin official press. In 1939 after the signing of the Molotov-Ribbentrop Pact between Nazi Germany and the Soviet Union and the Soviet invasion of Poland on September 17, 1939, the area became part of Soviet Ukraine. Many local inhabitants were deported to concentration camps. Following German invasion of the Soviet Union in 1941, most of Podolia was occupied by Nazi Germany and incorporated into the Reichskommissariat Ukraine. The area of Podolia between the Southern Bug below Vinnytsia and the Dniester was occupied by Axis Romania as part of Transnistria. Starting in July 1941, the Jewish inhabitants were subjected to mass extermination by shooting in a German campaign carried out by four Einsatzgruppen ("operational groups") specially organized for the purpose. Reliable estimates including German, Soviet, and local records indicate that upwards of 1.6 million, perhaps as many as 2 million, Jews were murdered in this fashion. Most were buried in mass graves, but there were also instances of communities being forced en masse into community buildings or synagogues that were then burnt, or herded into local mines that were subsequently dynamited. Podolia had been the center of a thriving Jewish community and culture since the late 17th century. All of that was extinguished within less than three years. The Germans eventually concluded that the method of shooting populations where they resided was too inefficient. At the January 20, 1942, Wannsee Conference, held as a result of the German need for a new method of extermination, they implemented the method of shipping populations to designated extermination/death camps, euphemistically referred to as concentration camps, equipped with poison gas chambers and crematoria. In 1944 the Soviets regained Podolia and in 1945, when Poland’s eastern border was formally realigned along the Curzon line, the whole of Podolia remained in the Ukrainian Soviet Socialist Republic. Most remaining Poles and Jews fled or were expelled to the People's Republic of Poland. The Podillya's folk icon-painting tradition is well known in Ukraine. Its manifestation are long home iconostases painted on canvas in the end of the 19th - beginning of the 20th cc. Red, green and yellow colours are prevailing, the faces of the saints are a little bit long, their eyes are almond-like. On these iconostases, the most venerated family saints were painted. The collections of Podillya's folk iconostases are possessed by Vynnytsya Art Museum and The Museum of Ukrainian Home Icons in the Radomysl Castle. ↑ Joachim Bahlcke, Ungarischer Episkopat und österreichische Monarchie: Von einer Partnerschaft zur Konfrontation (1686-1790). 2005. Volodymyr Kubijovyč, Ihor Stebelsky, Mykhailo Zhdan, Podilia in the Encyclopedia of Ukraine, vol. 4 (1993). It was slightly updated in 2010.